THE NEW JUNIOR minister with responsibility for the Gaeltacht has admitted his language skills may not quite be up to honours level. 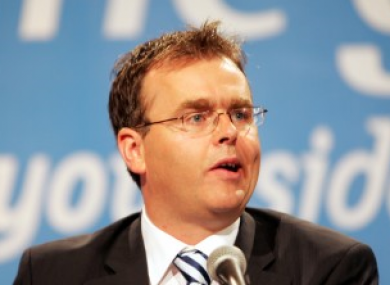 Donegal Fine Gael TD Joe McHugh was confirmed today as Minister of State at the Department of Arts, Heritage and Gaeltacht Affairs — and his job includes a ‘special responsibility’ for Gaeltacht matters. Surely having more that a mere cúpla focal would be a primary requirement for such a role, one would think? Maybe. But McHugh says he won’t be letting his lack of Irish hold him back. Speaking to Donegal’s Highland Radio, he admitted his grasp of the teanga was “not great”. But that’s because I haven’t been using it for a number of years. “Obviously like a number of people we went to school, we did primary school, we did Leaving Cert and we tried to learn Irish the whole way through. My conversational Irish certainly wouldn’t be great, that said. However, he stressed that he was keen to learn, and was willing to “immerse myself in the language now that I’ve got this particular portfolio”. Fianna Fáil TD and former Gaeltacht Affairs minister Éamon Ó Cuív said he was “shocked and disappointed” that the Taoiseach had chosen someone who is not a fluent speaker. “Having fluent Irish should be an absolute prerequisite for a Minister with responsibility for the language; without it they cannot adequately carry out their duties in Gaeltacht Affairs,” Ó Cuív said in a statement. He added that it showed the Government’s “total disinterest” in the the constitutional position of the language. After Ó Cuív raised the issue in the Dáil this evening, Enda Kenny said that McHugh will take a refreshers course in the Irish language. Meanwhile, a Government spokesperson said McHugh’s lack of Irish skills was simply “reflective of the fact that so few of our politicians speak Irish”. “I don’t think Joe McHugh is going to be found wanting in fighting for the cause. But it is a fact that not any of our politicians can speak Irish,” the spokesperson said. Email “The new Gaeltacht minister isn't fluent in Irish”. Feedback on “The new Gaeltacht minister isn't fluent in Irish”.